"Well, Mr. Robin, what is this youve found? Why, its a key! It looks as if it has been buried a long time. Perhaps it is the key to the garden!" Poor Mary Lennox. Orphaned at ten and sent off to dark and gloomy Misselthwaite Manor in Yorkshire. It's the home of her uncle, Archibald Craven, whom she has never met, and who doesnt even want to see her. Mary has no friends to play with, no one to talk to and nothing to do. But then one day a friendly housemaid tells her about a mysterious hidden garden somewhere on the grounds. Where is this secret garden? And why did her uncle lock it up and bury the key? As Mary investigates, she discovers a beauty she had never known before, and uncovers another secret, hidden away down the long corridors of the lonely mansion. 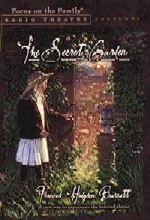 In this remarkable dramatization of The Secret Garden, youll find all the characters from the much-loved classic: Colin, the bedridden boy who thinks hes going to die... Ben Weatherstaff, the cantankerous gardener... Martha, the kind-hearted maid... and her little brother Dickon, who has a wondrous way with animals and gardens. And of course Mary Lennox herself, the lonely orphan girl who discovers the secrets of Misselthwaite Manor. This delightful audio drama was recorded in London with a star-studded cast, including Dame Joan Plowright, Ron Moody, Prunella Scales, Bernard Cribbins, Cathy Sara and Alex Jennings. With sparkling film-quality sound design and music, it creates a world that will inspire your imagination. "See? Behind the ivy, theres a doorway. Come on. Its my secret garden, and I’m the only one in the world who wants it to be alive."